The hubby and I are big fans of Mexican (the Americanized kind) food. The past year I've tried a variety of Mexican dishes at home every time a Mexican food craving hits us. Making it at home gives me the option to choose my ingredients and spice it up the way we like it. Fajitas is often referred to a mixture of meat cooked with onions and bell peppers, eaten with warm flour tortillas. I made Fajita Quesadillas, sans the meat...with only the onions and bell peppers and cheese. And of course I added a few other ingredients we love - like black beans and corn (I use that in almost any Mexican dish I make!) You can leave these two out if you like. Heat oil in a pan. Add the grated garlic, sliced onions and peppers. Saute on medium heat till the onions and translucent and peppers are soft. Season with salt and red chilli flakes. Stir in the black beans and corn. Turn off heat and cool slightly. Meanwhile heat a cast iron skillet. Place tortillas one by one and warm them till they are pliable. Set aside between paper towels or wrapped in a cloth till ready to use. Take one tortilla, evenly spread about ¼ cup of cheese and half of the fajita filling. Spread another ¼ cup of cheese on top. Carefully transfer this to a hot skillet. Place another tortilla on top of the filled one and press gently. Cook until the cheese begins to melt on the underside and the tortilla begins to crisp up. Carefully flip the quesadilla and cook till the cheese melts. Remove from heat and repeat with the remaining tortillas and filling. Cut the quesadilla into wedges and serve with the Pico de Gallo. We had the Fajita Quesadillas with Pico de Gallo, which is a mix of fresh tomatoes, onions, jalapeno or serrano chilli and a little bit of lime juice. Combine all the ingredients, stir and refrigerate for an hour or more till ready to serve. Leftover Pico de Gallo makes for a great dip with tortilla chips. we like mexican food at our home.. love th quesadillas with Salsa. Pico looks so fresh..
Another mouth watering Mexican dish! New look of the blog is really good, so are quesadillas! 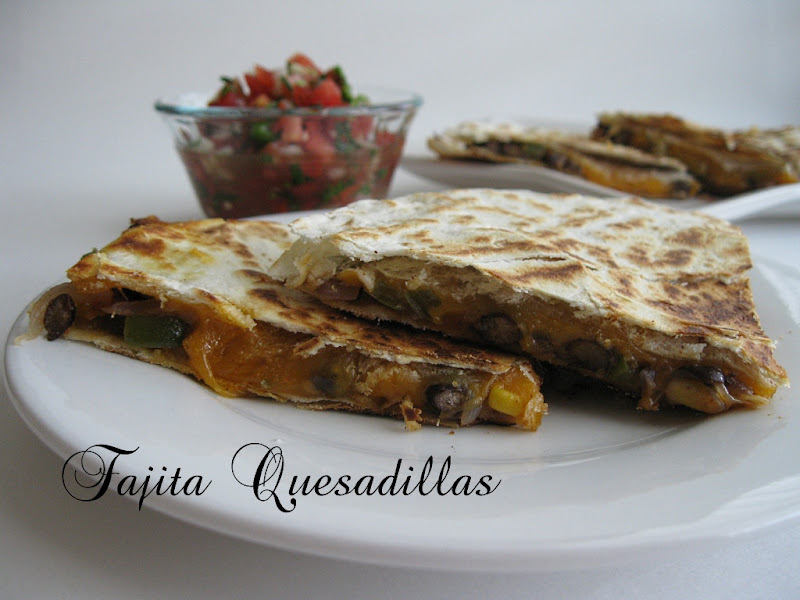 lovely quesedillas..I just love dem..
quesadillas looks yummy and wholesome. nothing like a tasty but one dish quick meal.